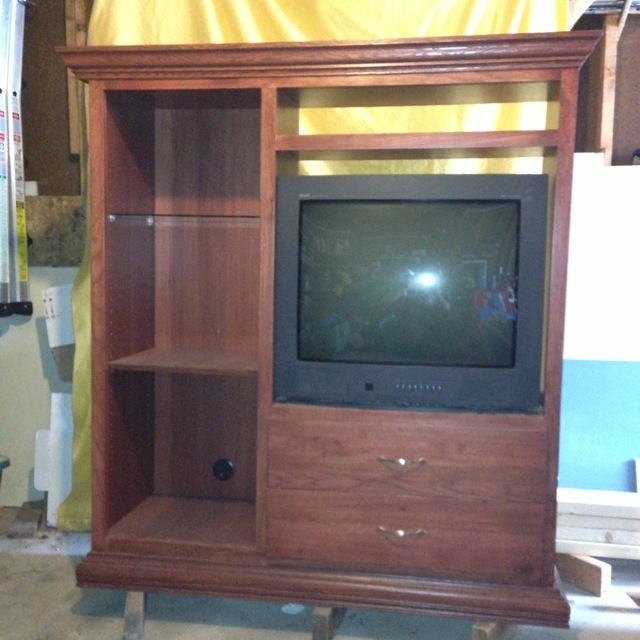 This past spring, I bought an entertainment unit off of Kijiji for $15. The unit was custom-built by the previous owner and very sturdy. The unit itself rests on a base that has a decorative molding around the outside of it and the top molding piece can also be removed. You would never know it when you see the unit assembled, but it certainly makes the heavy piece easier to move when it can be somewhat dismantled. As you know, these types of cabinets are virtually becoming obsolete with the influx of flat screen televisions. You can often find melamine or veneer type units on Kijiji for cheap, but it is rare to find one that is of such good quality for so little. The is the original entertainment unit. 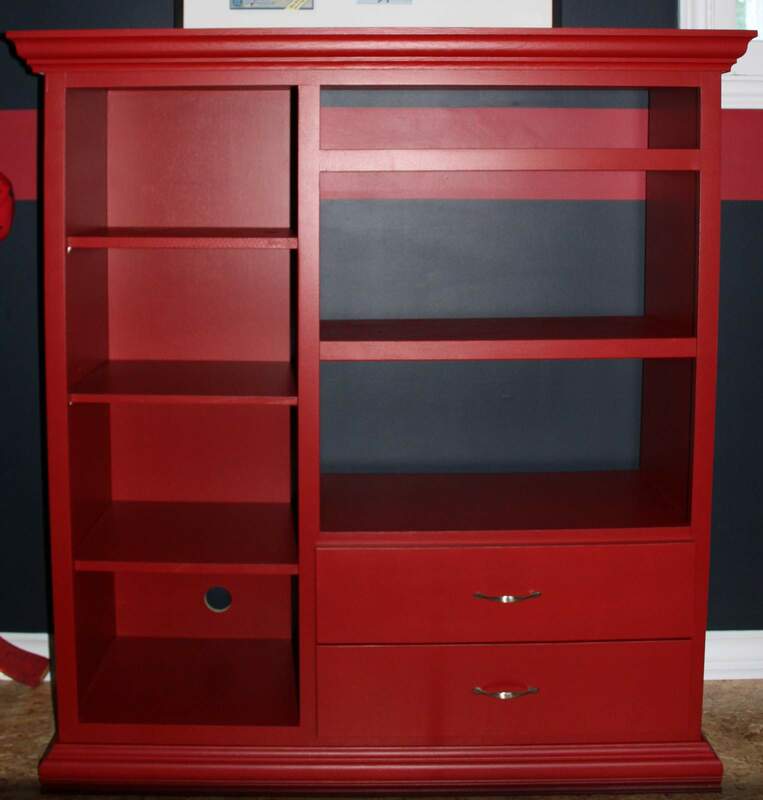 I decided to paint the unit red with the intent on it becoming a major furniture piece in my son’s room. I had 2/3’s of a quart left over from when I originally painted his room. The original red I used was called Lyon’s Red (Benjamin Moore). I got one good coat done and most of a second, but being red, it really needed a third coat to get proper coverage. I was feeling that the original red was slightly pinkish and I wasn’t totally loving it. I needed to buy another quart to finish the unit properly and decided to go with a very slightly different red. You can hardly notice the difference b/w the stripe on his wall and the red unit, but the final project is exactly the hue I was looking for. I love, love, love this red ~ Benjamin Moore Caliente (AF-290). The colour in the photo looks a bit blotchy, but it is not ~ the paint coverage is very even. Originally, I had planned to cover the back, but decided to wait to see what it looked like with his wall behind. I think that once everything is inside it will be fine, but I can always go back and add a back if we find it a problem. I purchased some canvas totes for the tower and plan to books in the shelves where the television used to sit. The total cost of this project was about $70 ($15 for unit,$30 for wood and $25 for paint). The prep work was a bit time intensive, but the actual modifications/building was minimal. Look for the cabinet in the upcoming post on my son’s completed Hockey Themed Room. Posted on August 21, 2013 by Cindy Roy •	This entry was posted in DIY and Upcycling and tagged DIY projects, entertainment unit upcycle, furniture make-overs, tv cabinet upcycle, upcycling projects. Bookmark the permalink.